The office is probably the least ‘decorated’ room in my apartment, it’s very functional but has sloped ceilings which makes for limited wall space. This office has my jealousy burning for a tall wall in front of my desk to lean art against — I love the lighting and layering. 5 Responses to "Office space." By nature I think the office is one of the hardest spaces to decorate. I think the photo you chose would be a great jumping off point. 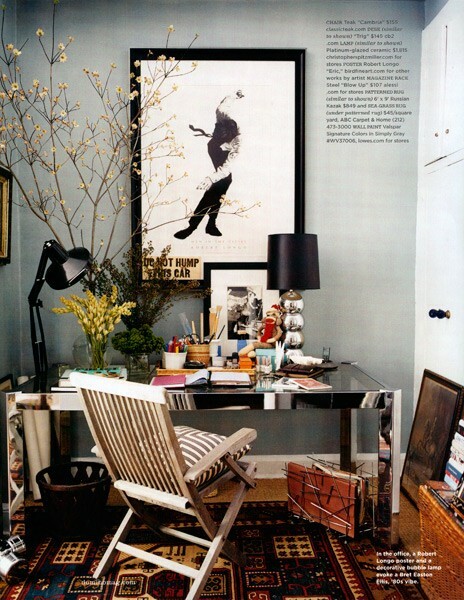 That file/magazine rack on the floor is great! The garbage can is very chic too! lovely office inspiration. having a small office can be just as great, in my opinion. make it feel big by having minimal clutter, and i think you’d be good to go!